Never in a million years did I think that I would be replacing mashed potatoes with cauliflower puree at Thanksgiving but we will be this year. This puree is silky, creamy, and delicious. Best of all, we made the switch from potatoes to cauliflower a few months ago and my kids still haven’t noticed. Cut the cauliflower into florets. If your cauliflower came with leaves, cut them into 1/2 inch pieces. 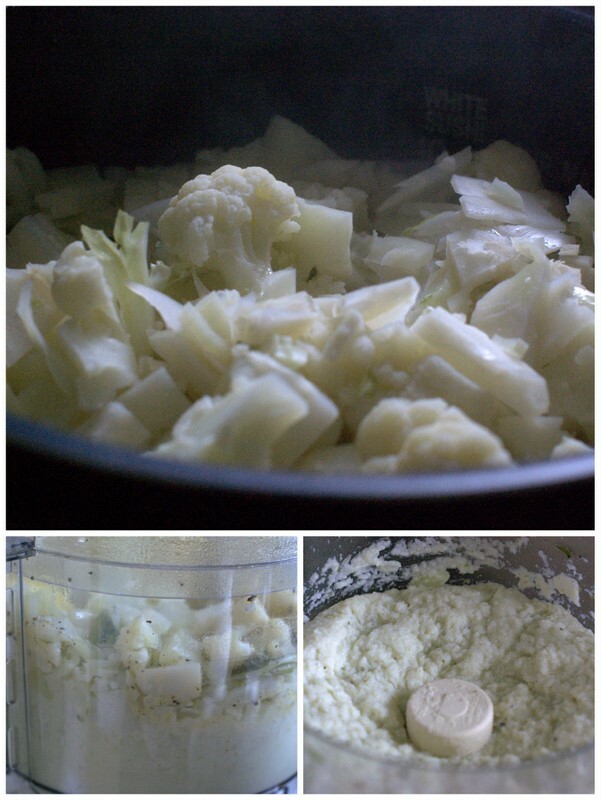 Steam your cauliflower florets and leaves in a pot fitted with a steam rack. I did this in my rice cooker and it took about 20 minutes. Once your cauliflower is fork tender, drain the steaming liquid, and place the cauliflower in a food processor with the butter and puree until smooth. Season with salt and pepper to taste. First prepare the butter by putting it in a bowl with the garlic and spices. Using a fork mash it all together to mix everything together. Set aside. Put the chicken on the cutting board with the breast facing down and, using kitchen shears, cut off the spine. Turn the chicken over and press it down to flatten it out. With your fingers gently separate the skin from the meat wherever you can: the breast, the thighs, the legs being careful not to break the skin. If you do it’s no big deal but more butter will run out instead of staying close to the meat. Spread the butter underneath the skin leaving an even layer of butter everywhere. Smear any remaining butter – there should not be much – over the skin. Sprinkle the skin with a couple of pinches of salt, cracked black pepper, paprika, and a pinch of cayenne. 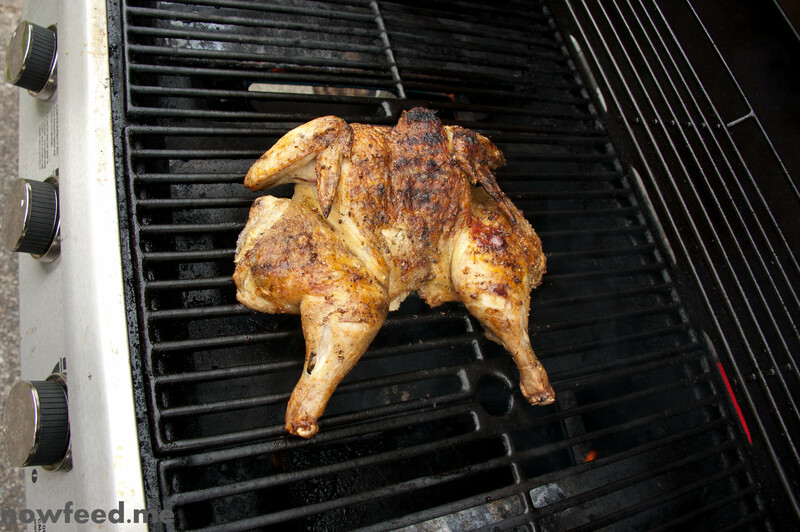 Preheat the grill then place the chicken on skin side down. Cook for about 20 minutes, spraying down any flare ups if there are any. After 20 minutes flip the chicken over and grill for another 20 minutes or so. I use a chicken that its about 3 to 3.5 pounds. Larger birds will require a longer cooking time, as will one which was not near room temperature when you started. Sorry there aren’t more pictures on this one. This is the only one that came out. Feel free to experiment with other spices. Pretty much anything you would use for a roast chicken will work, taking into account what might burn over an open flame. It’s mostly under the skin mixed into the butter so that shouldn’t be much of a problem. Another idea which I tried in the oven and that I will try on the grill is a curry chicken for example.